Well my friends, by the time you read this, I will have (fingers crossed) successfully drove myself, two children, and one big yellow dog all the way to the great state of Wyoming. ....but we are so excited to play and explore small (we're talking very very small) towns! we'll be back soon.....enjoy your week!! Oooh! Have fun! Sister time is the best. I'm impressed that you are driving up there by yourself! I am planning a trip with the kiddos up to my sister's in Idaho once they thaw out a bit. :) Have fun! Drive safe! 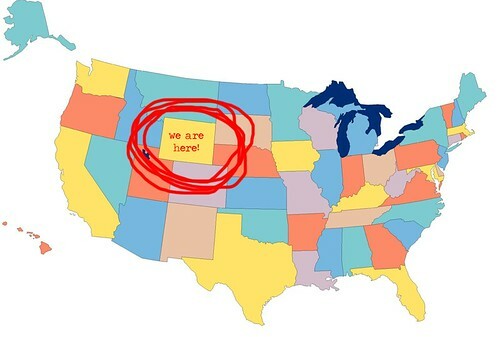 what a surprise to see my state circled on a map! welcome...hope the weather's ok for you. .. so glad we were able to make the trip ... throughly enjoyed the sledding party with Jo and 'Pink Kitty'... have a fun rest of the week! You are so brave to drive alone with 2 kids. No your blog is adorable! I just read through the whole thing. You have such a darling life. Your kids, husband, kitchen table etc. :) And I just tried the peanut butter cookies you posted. Delicious! I can't wait to try the others.